At the end of 2003, a horde of between 15 and 20 previously unknown Netherlands Indies 10-cent proof notes were offered for sale in Indonesia. This lot was reportedly owned by the grandson of an employee of De Javasche Bank (Java Bank, the banknote-issuing authority in Dutch colonial Indonesia from 1828 to 1953). I was fortunate enough to obtain one of these notes in aUNC condition with minor tropical staining for US$400, and currently know of five more in private collections or sold at public auction. As is often the case with new discoveries of old notes, this acquisition launched me on a journey of investigation to attempt to determine the authenticity and history of this interesting little note. • The design has similarities with the 10- and 25-sen notes (Indonesia P31 and P32) of the post-WWII issue, dated December 1, 1947. • The dimensions are identical to that of the 10-sen note of the post-WWII issue, dated December 1, 1947. 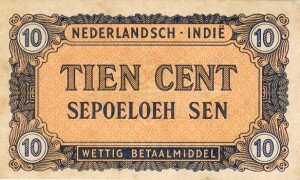 • The nominal value of the note is printed in both Dutch (TIEN CENT) and Indonesian (SEPOELOEH SEN); this combination appeared on notes issued from 1943 by the NICA (Netherlands Indies Civil Administration) to 1948—the last Netherlands Indies post-WWII issue—in response to calls for more nationalistic expressions on paper money. • Although the “Muntbiljet” (state notes) series from 1920 also uses the terms “Nederlandsch-Indie” (Netherlands Indies) and “wettig betaalmiddel” (legal tender), the first note that spells the former with an umlaut over the last letter (ë) is the “Muntbiljet” series dated June 15, 1940. • De Javasche Bank issued banknotes with denominations of five gulden and higher; lower denomination state notes were issued by the Netherlands Indies government. Based on these considerations, I assume the note originates from the period between June 1940 and December 1947. During my research, I discovered an article written by P. J. Soetens (former archivist of De Nederlandsche Bank, the Dutch central bank) about unissued De Javasche Bank notes during the same period that could very well explain the origin of this 10-cent proof note. According to Soetens’ article, the German invasion of the Netherlands in May 1940 broke the colony’s relationship with Joh. Enschedé en Zonen, its traditional banknote supplier in the mother country. In order to meet the demand for Netherlands Indies paper money, De Javasche Bank requested the printing company of N.V. Kolff’s Offsetdrukkerij in Batavia (now Jakarta) to design a new series of notes in denominations of 5, 10, 25, 50, and 100 gulden. Johannes-Wouterus Donkers, operations manager at this printing factory, developed a design for the 5-gulden note. The design of the 5-gulden note was approved by the De Javasche Bank board, and a small number of notes intended for issuance were then printed. Preparations were also started for the design of 10- and 25-gulden notes. Unfortunately this process was disturbed by the Japanese invasion of the Netherlands Indies in March 1942. Subsequently Kolff deliberately destroyed its stock of 5-gulden proof notes, though the printer saved a few sheets as well as a bundle of 500 finished notes (overprinted “SPECIMEN” on front and back and twice perforated “BETAALD” [paid]). Together with the original drawings, these sheets and cancelled notes were transferred to De Javasche Bank. Donkers was arrested by the Japanese in early April 1942 and placed in a camp where he joined several board members of De Javasche Bank, including Gerard Gillis van Buttingha Wichers and J. C. van Waveren. During his captivity, Donkers decided to design a series of banknotes in denominations of 1, 5, 10, 25, and 50 cents in preparation for Japan’s surrender. In May 1943, Donkers was transferred to another camp, but not before burying his designs and tools in large glass bottles in the garden of the house where he was kept prisoner. Notes using these designs were subsequently produced at the First Military Printing Works in Batavia, headed by Mr. H. Eikenberg, although they were printed on only one side despite Donkers’ objections. These notes were intended to be issued together with a new series of De Javasche Bank notes and replace the circulating NICA money. However the stock of NICA money appeared to be insufficient to allow the production of the new De Javasche Bank notes to finish. As a consequence it was decided to re-introduce the pre-war Netherlands Indies paper money and not issue the uniface notes designed by Donkers. While Soetens’ article does not contain any illustrations of these notes, I believe my uniface 10-cent proof note is from this production because its time-frame fits with Soetens’ facts, and the proof note resembles later issued notes subsequently designed by Donkers. At the end of 1947, Donkers traveled to the Netherlands for his evacuation leave. Only weeks after his arrival, Kollf ’s management requested he design banknotes in the denominations of 10 and 25 sen because of the huge demand for small change in the Netherlands Indies due to hoarding of copper and silver coins. Once the designs were approved, the Dutch Department of Overseas Territories requested that Donkers return to the Netherlands Indies to take charge of the local production and issuance of these notes. The 10- and 25-sen notes were finally put in circulation on December 1, 1947. The 10-sen note contains Donkers’ initials (JD) at the bottom of the palm trees on the back. On the 25-sen note, his initials are at the bottom of the decorations in between the legal notices on the back. In late 2006, I was offered a collection of heretofore unknown Netherlands Indies proof notes with denominations of 1, 5, 10, and 25 cent. Because the design of the 10-cent note was identical to the proof that I had purchased in 2003, I was excited about the possibility that the other denominations were from the same series Donkers had designed while a prisonor of war. After receiving the notes, I and some other Netherlands Indies paper money experts determined that all but the 10-cent note were obvious forgeries produced by modern inkjet printers on contemporary paper. Although this finding was disappointing, I am encouraged to believe that originals may exist somewhere because the designs are well executed and consistent across the family, indicating the forger may have access to Donkers’ designs printed and supposedly destroyed by the First Military Printing Works. Only time will tell. Boegheim, L. M. J. De Beeldenaar (bi-monthly Dutch magazine for numismatics), Issue July/August 2000, Year 24, number 4, “De Noodgeldemissie Nederlandsch-Indië 1947,” pages 175-182. Soetens, P. J. Jaarboek voor munt en penningkunde (Yearbook for Coins and Medals), year 1971/1972, “Enige aantekeningen rondom niet in circulatie gekomen bankbiljetten van de Javasche Bank N.V. model 1942 en de Nederlandsch-Indische muntbiljetten model 1940 en 1946,” pages 159-164.